Aerial and timelapse photographer Django G-S of Team Team Wolf travels around in his adventure van photographing landscapes, weddings, and more. 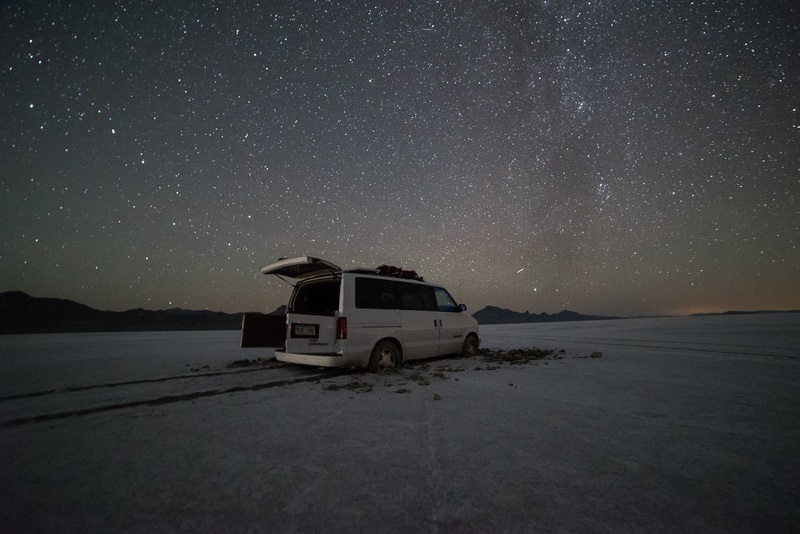 During a recent expedition, he got his van stuck one mile into a drive across Utah’s Bonneville Salt Flats. The Bonneville Salt Flats is essentially a 40 square-mile salt desert located in northwestern Utah. The expanse is public and managed by the Bureau of Land Management, which allows visitors to drive it freely and racing companies to utilize it as a speedway. According to Django, he didn’t know that his 16 year-old AWD van was at risk of getting stuck until it was too late. Though he often uses his 4K-shooting DJI Inspire 1 Quadcopter drone in his work, Django used his Sony a7S to photograph his predicament as a 15-20 second long exposure at ISO 20,000. The following morning, he took another photo with his Canon EOS 6D and shared it via Instagram (see above).